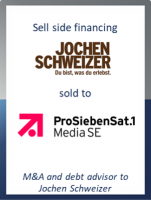 GCA Altium acted as exclusive financial advisor to Jochen Schweizer on the sale of a majority stake in his experience gifts business to ProSiebenSat.1 Media SE, one of the most successful independent media companies in Europe. Jochen Schweizer has built up the eponymous Munich-based company into a leading provider of experiences and experience gifts in Germany, Austria and Switzerland and is a pioneer in the digitalization of the leisure and experience sector. The online shop at www.jochen-schweizer.de is a source of inspiration and a search engine for thousands of different experiences around the world. The products are also available in over 40 proprietary shops and from more than 5,000 retail partners in Germany and Austria. The experience and event voucher market is posting attractive growth rates in the German-speaking region. ProSiebenSat.1 will combine the acquired company with its own 100% stake in mydays under the umbrella of Jochen Schweizer mydays Holding GmbH. ProSiebenSat.1 will have a 90% and Jochen Schweizer a 10% stake in this new company. For ProSiebenSat.1, with its strong presence in the TV and digital markets, the expansion of its portfolio with Jochen Schweizer's brand, expertise and omnichannel positioning is a perfect fit for the Group’s consistent commerce strategy. Jochen Schweizer, Chairman of Jochen Schweizer Holding GmbH, said: "By combining the two companies, we are pooling their expertise and strengthening their position vis-a-vis international market participants. At the same time, we are providing Jochen Schweizer GmbH an even better basis for further expansion." This transaction marks GCA Altium’s 35th transaction in the Consumer & Retail sector since 2015 making it one of the leading teams in this space in Europe.